For the second year in a row, a DISA facility was recognized for excellence in energy conservation by the Naval Support Activity South Potomac (NSASP), which provides installation management services for more than 20 locations in the National Capital Region, including the Naval Support Facility (NSF) in Indian Head, Maryland. Installation of energy efficient LED lighting in several areas inside the JITC complex. Replacement of an exterior warehouse hanger door with an insulated rollup door. Upgrading several aging heating systems to energy efficient heat pumps. Installation of water saving valves in restrooms. Closely monitoring and controlling building temperatures and lighting use. Also for the second year in a row, Raymond Hrynko, facility team lead and energy officer at JITC Indian Head, was individually recognized for his support for and enhancement of the NSASP regional energy program. 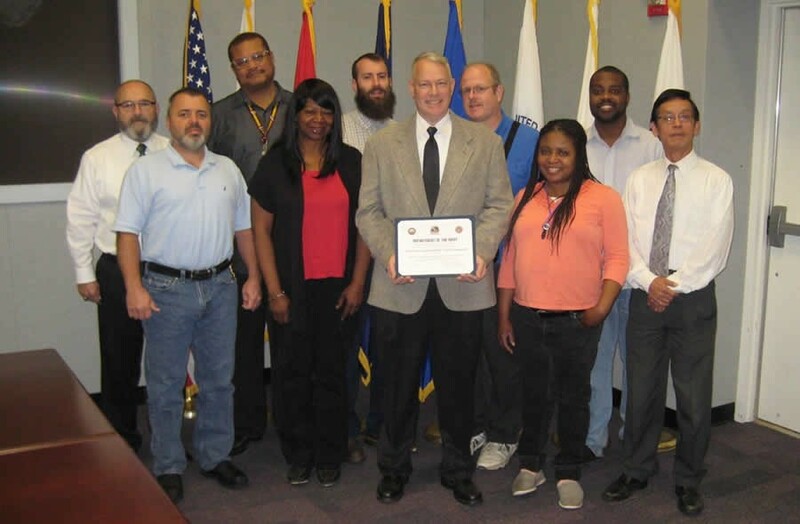 The Joint Interoperability Test Command (JITC) Facility Team at Indian Head, Maryland, accepts the 2015 Naval Support Facility Activity South Potomac’s Annual Energy Award. Raymond Hrynko, facility team lead and energy officer at JITC Indian Head, was individually recognized and is holding the award certificate. From left to right: Carlos Blanco, contract support; Mike Meadows, contract support; Jerry Welch, JITC; Sheila Carroll, contract support; Matt Bolster, contract support; Raymond Hrynko, JITC; Bill Bott, contract support; Michelle Perry, contract support; Carl Huff, contract support; Tri Nguyen, JITC.